Thanks everyone! I’m really thrilled at the feedback I’ve gotten on the comic, and I never expected that this many people would ever see it. All the kind words I’ve gotten really mean a lot. What I’ve got here is really a rough draft, and there’s more to come! But how can you find out when I have new stuff? I’m glad you asked. I set up a new Twitter account and Facebook page that you can follow if you’d like to get updates on the comic. You can also subscribe to my blog’s RSS feed or get an email subscription (the subscription button is in the sidebar). But here it is! 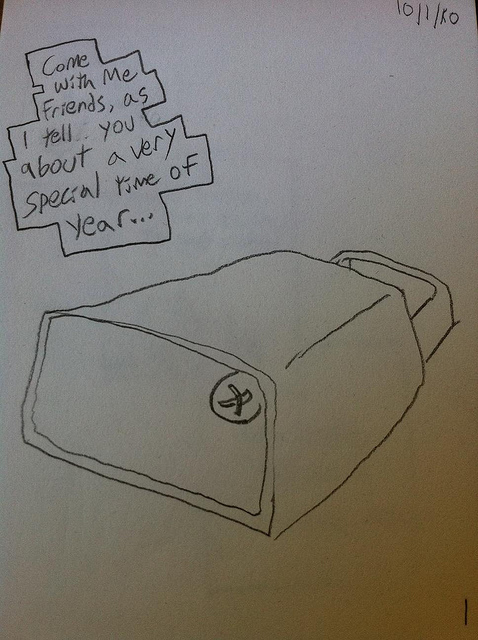 It’s about my favorite time of year… I’m a bit embarrassed about most of the drawings in here! I hope you like it anyway. Perhaps soon I will clean it up a bit (okay, a lot) and print it! Please leave a comment if you enjoyed it or want to tell me what’s wrong! Or email me! slonie AT gmail.com. 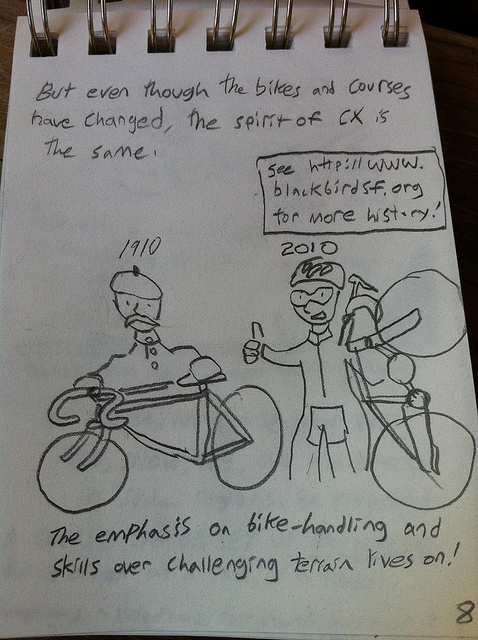 Blackbird SF’s Raw Pre-War Cyclocross – Historical Burliness! 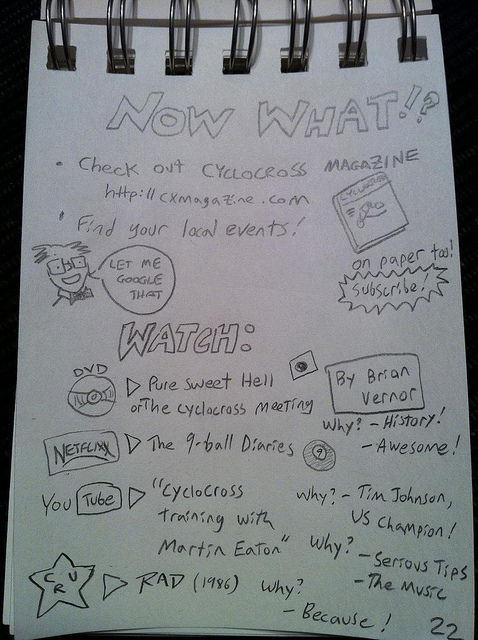 Cyclocross Magazine – A Good Starting Point! Cyclo-Cross Training & Technique – Martin Eadon’s video. With Awesome Music. 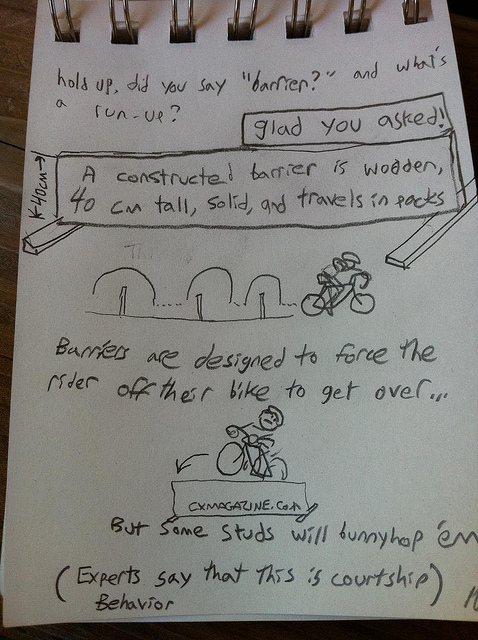 This entry was posted in Art, Bikes and tagged art, bicycle, bike, comic, crosscomic cyclocross, cxcomic, cyclocrosscomic, racing. Bookmark the permalink. Hey Ben, glad you liked it! 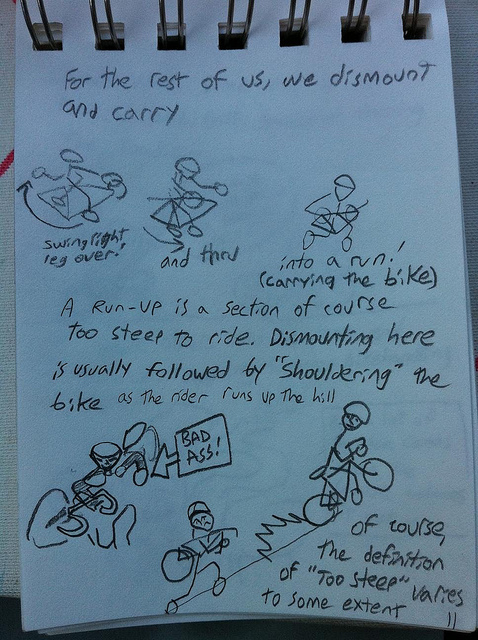 I often find myself explaining cyclocross to people “from the top”, so a lot of the script came easily when I wrote this. It’s (almost) all true! Nice work! 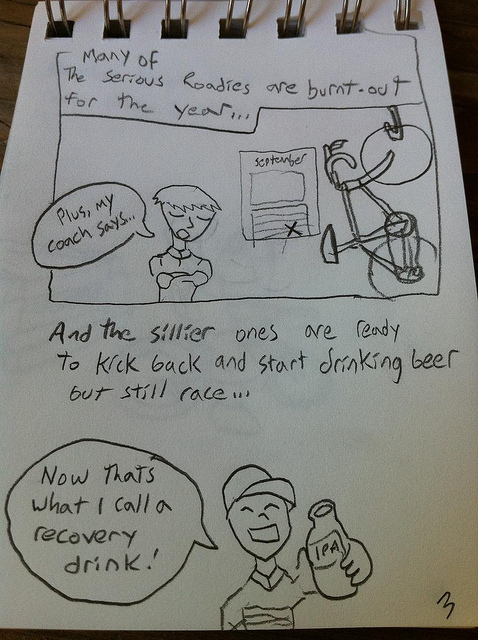 Sums things up quite nicely….especially the post race beer or cupcake! Thanks David! 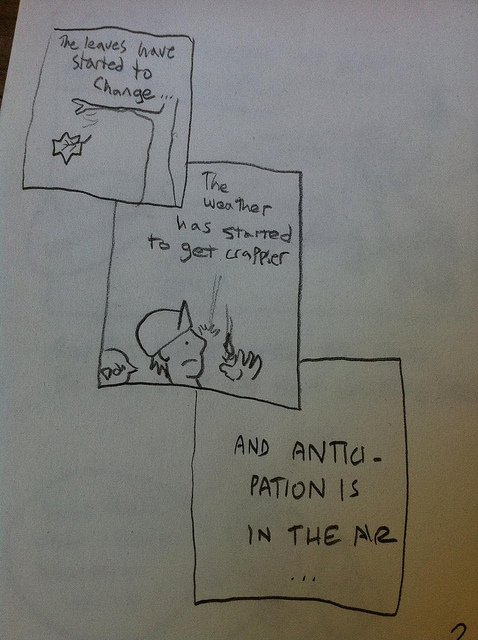 Nothing like drawing from personal experience, right? 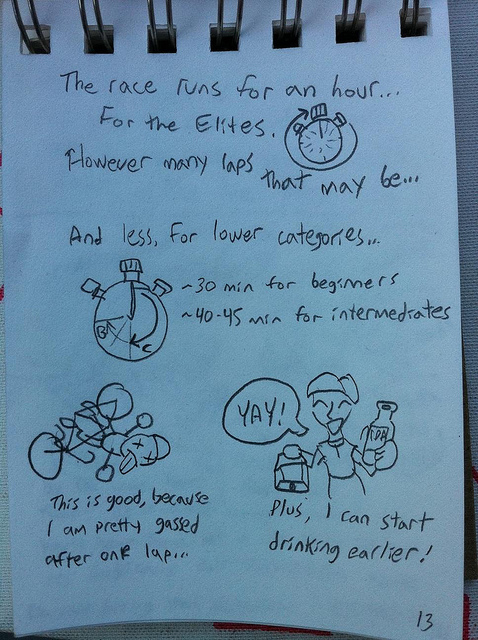 When I revisit this I am going to do an expanded section on pre-, intra-, and post-race “nutrition” that ought to be good for a laugh. lee, this is a work of genius! 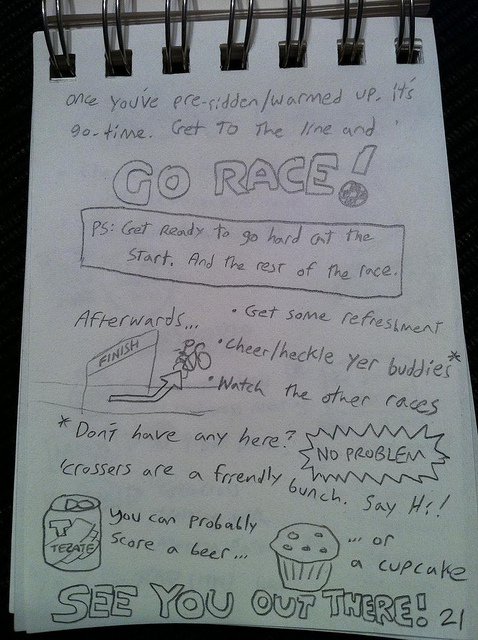 You forgot the part about riding your bike to the race. real nice work. that is what the sport needs. in Europe we are to conservative, I think. you should bring the book to the book store! Thank you very much, Bernd! Cyclocross has a bit of a different flavor here, I think (even though lots of Americans want it to taste Belgian!). I’m really happy to hear that people over there dig the comic! As soon as I redraw and expand it a bit… Prints for sure! i really hope you do print these. i imagine keeping one in my pocket at all times, particularly during family events. it would be so efficient! I would buy it and keep it on my coffee table from Sept thru February!! Great work. 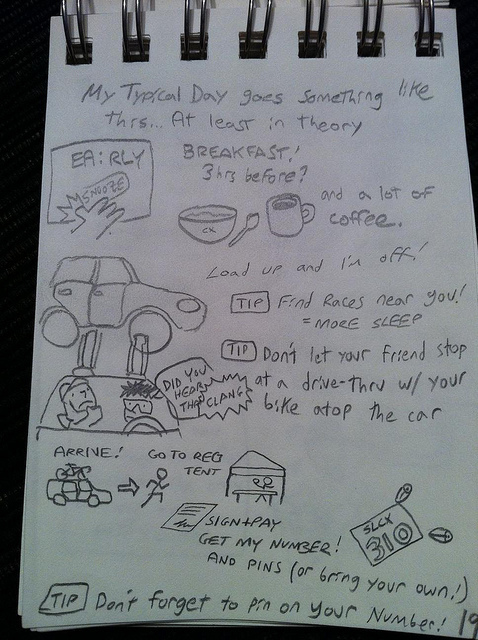 I helped Brian make the Cyclocross Meeting on the Japan side. I’m promoting heavily on cross in Japan. Is it okay to download these images and use on my blog? Will of course lead readers this way. This was so cool. I showed it to my kids who wondered what exactly it is I do every Sunday….thanks so much! Love it! very funny, entertaining and informative! Makes me even more psyched to race this weekend. 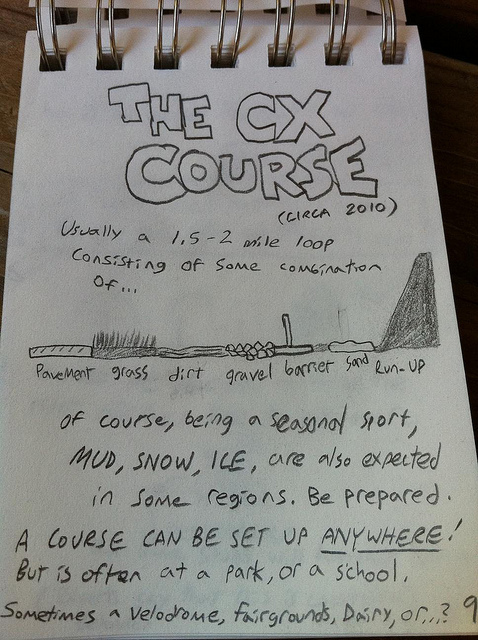 we totally need a pdf; you forgot the most annoying this about cx is having to explain it to everyone! Fantastic. I’ll send curious friends to this – easier than trying to explain it! This is great. I am just starting out, and the tips, “links”, etc. are all very helpful. 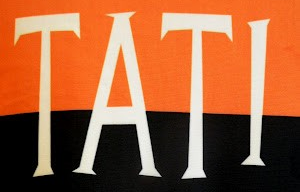 I did discover a spelling mistake though – its Eadon, not Eaton. Found the videos anyway, so helpful. I’m glad it’s been of help to you! I just moved into a cyclocross-rich city, and it’s everywhere! I do need to get out to watch a few races and experience this stuff! Awesome job! 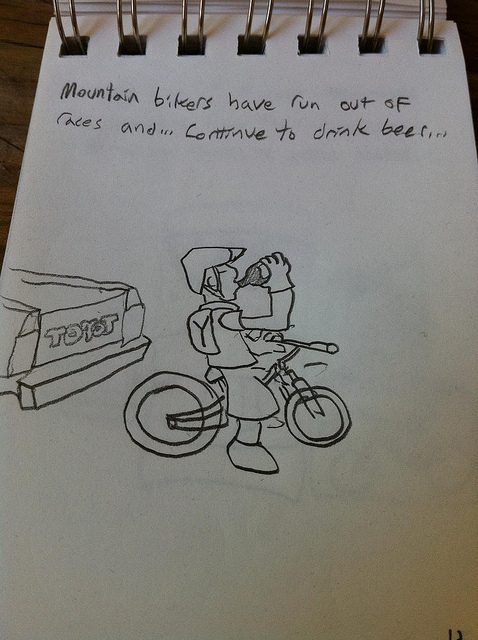 I would love to have it as a good ole fashion xeroxed ‘zine to hand out to my customers (bike shop). I’d definitely like to make such a thing available! This is great! Thanks for sharing it with me. I am sooooooooo uniniated in the wonderful ways of the wheeled world that you inhabit! Great art and educational too. Keep these comics coming! Great stuff…Although I believe you are missing an integral part, that often times happens somewhere between showing up and go race. That would be “Carbo Unloading” otherwise spot -on. Rich, let me tell you about the time I set a “PR” when I realized I had to do this before a major race last season… Or really, that might be a little TMI. I think I’ll need to add your tip to the final draft! Very cool. Nice work. 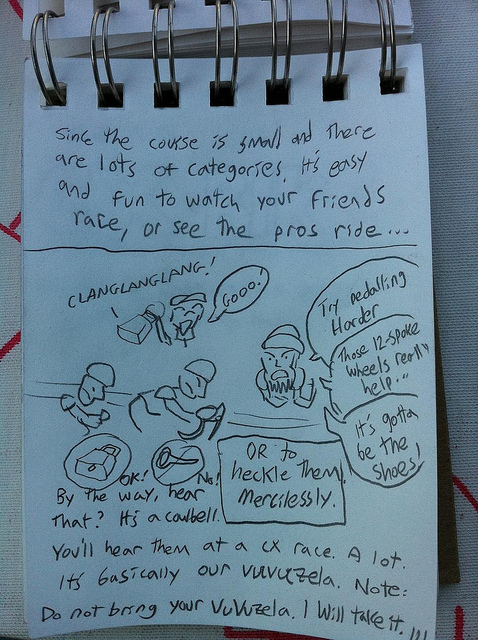 I love the beginning with the different types of riders “coming together in a magical place we call cyclocross”. 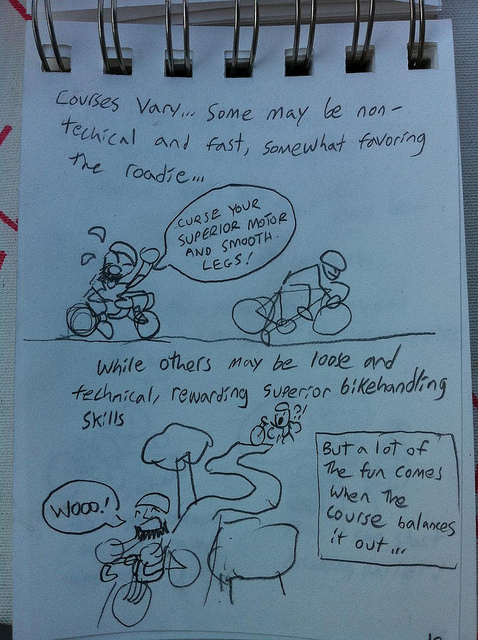 I’d love to see more on this – what happens when the different types of cross riders race together. 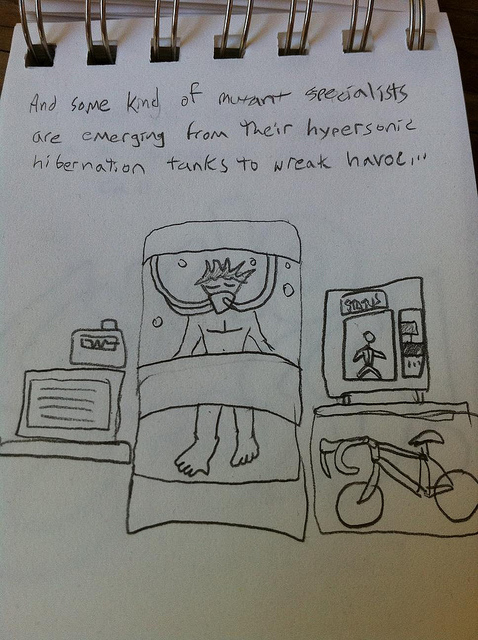 I personally come out of my hibernation tank every September. My least favorite part of cross is dealings with way-too-serious road racers who yell at you if you don’t ride how they want you to. Although one of my favorite things about cross is kicking those guys’ butts (who ride bikes worth more than my car) in a cross race. Since I’m continuing to refine the comic, I’ll probably try to expand that section… After all, that’s the only part of it that really followed the format of a narrative comic! This is just splendid! I was an art student when I was younger, and I illustrated children’s books (one of ’em even got published). Would you be willing to let me re-draw your ideas and clean up the typeface a little bit? It would make a great project for this ex-artist to play around with a bit, and I really do think you’ve created something unusually special! The artwork concept and text are already perfect. Can you explain what it means to collect/wave dollars at the top of hills? Put another way, getting a dollar grab in a race makes you feel like a hero no matter how well your race is going. And it helps out with your entry fee! 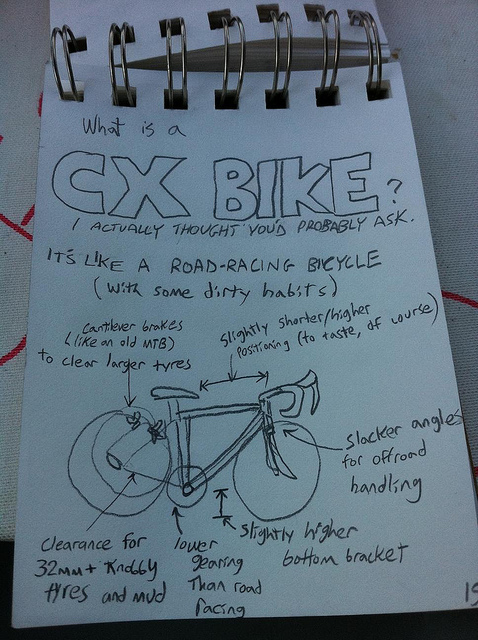 I say keep it raw and sketchy, just like cyclocross – why polish it up? Also, I humbly suggest this link to Cross Results – I don’t have any affiliation or anything, so it’s not like I’m self promoting. I just find that peiople who are just getting into the sport can enjoy tracking their progress and improvements, and pick out who to mark at the races. Thanks for the feedback! I know people like the original, but I just can’t live without redrawing at least a little bit of it… Of course, I also said I’d like to be done with it before the end of the season, and that certainly hasn’t happened yet. As for crossresults, I love that site. I’ll definitely add it to the list of links. Great comic! Very motivating to try cross next year when road season is done! Thanks for the jump! You’re welcome, that’s what this comic was all about! If it was possible, I’m now dumber than I was ten minutes ago. 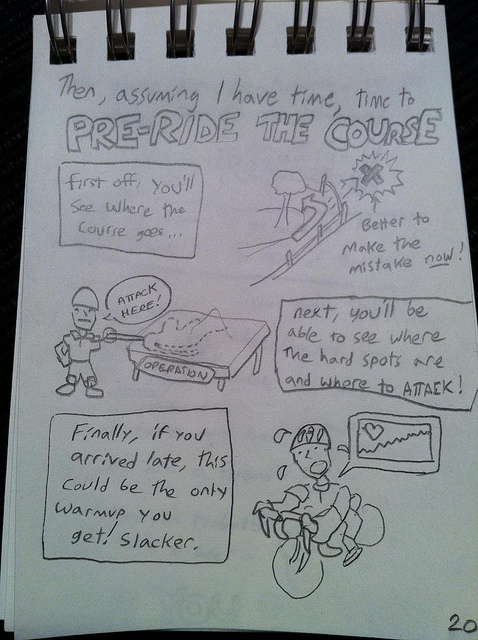 I had to come re-read my favorite comic ever now that it’s cross season. Totally awesome. Love it! Can’t wait to see more. good stuff! Well done! Super entertaining! 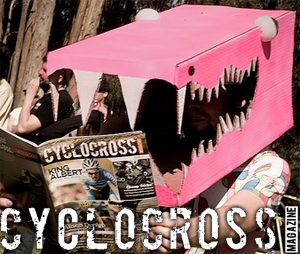 Well thanks to you I can no longer say I don’t know what cyclocross is all about. BTW the comic is perfect… and all yours. I wouldn’t change a thing! This is great!! 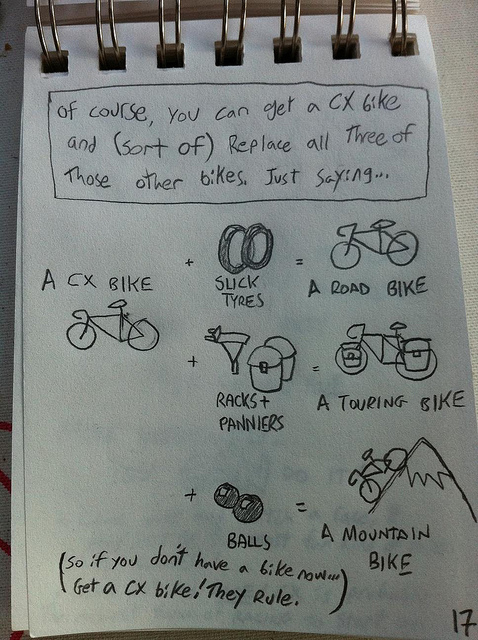 I came across this from a link on twitter and was immediately thrilled because I just a comic about cycling. 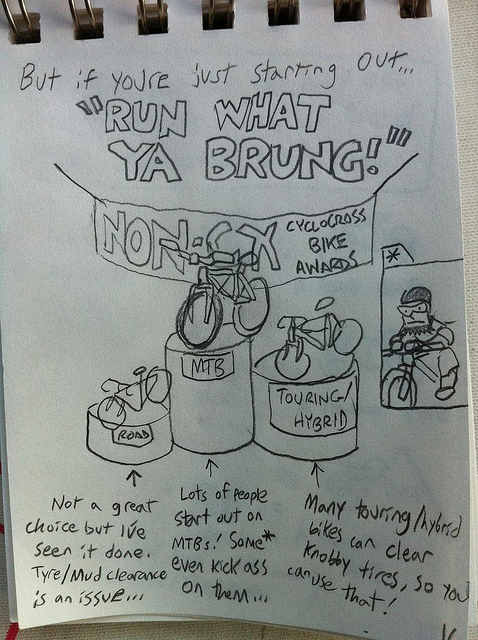 Love it, and congrats on getting into cyclocross mag! My partner reads it so I wonder if he has read your stuff already! 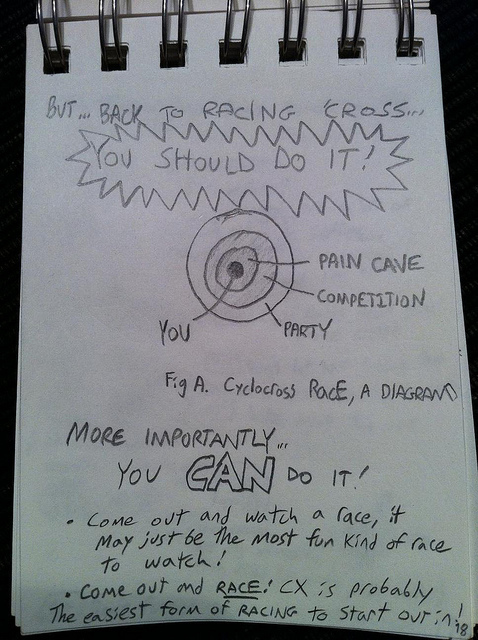 And, cyclocross rocks! Can’t wait for the upcoming season! 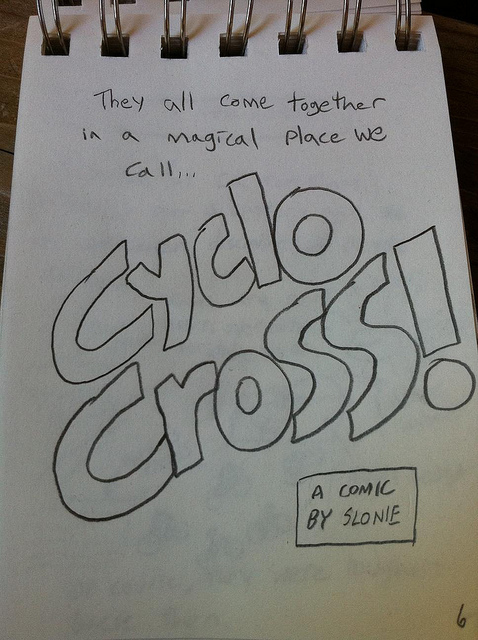 I was referred to this comic as an intro to cross before i dive in this season. I was a bit unsure until the final page where you suggest watching “Rad.” Rad is the greatest love story ever told, and if knowing it front to back will help me with CX, I am confident I will win my first race. Good stuff. This is probably the best comment that will ever be left on my blog. Thanks, and you’re gonna walk that sucker! 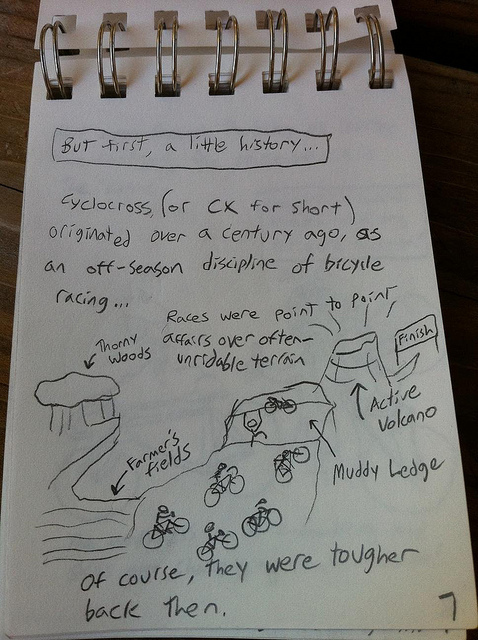 Pingback: Cyclocross Season (cross-cross-post) | Team Monster Truck p/b Hub Bicycle Co.